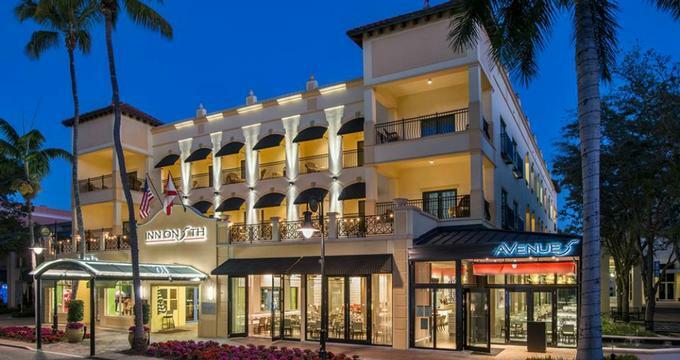 The Inn on Fifth is a luxurious boutique hotel in the heart of downtown Naples on Florida's beautiful Gulf Coast. Situated on the fashionable Fifth Avenue South in the center of the celebrated shopping, dining, and entertainment district, the Inn on Fifth offers style and sophistication with 119 elegantly appointed guest rooms and suites, including 32 luxurious Club Level Suites located in a separate, private building. Upscale amenities include the intimate Spa on Fifth, a fully equipped fitness center and gym, an award-winning restaurant, Truluck's Steak, Seafood and Crabhouse, and premium concierge services. Ideally located for enjoying all the sights and sounds of downtown Naples, The Inn on Fifth is a short walk from several restaurants, bars, boutique shops and nightclubs, as well as a beautiful beach and the ocean. The Inn on Fifth features 119 well-appointed and stylishly decorated guest rooms and suites, including 32 luxurious Club Level Suites, which are located in a separate building and offer extra levels of luxury and privacy. All accommodations boast a contemporary design with modern furnishings, king or queen-size pillow top beds with luxurious bedding, en-suite bathrooms with shower/bath combinations and furnished Juliet balconies or terraces with vibrant streetscape views. Guest rooms and suites range from Deluxe and Plaza Rooms to Deluxe View Rooms, Junior Suites, Royal Suites and Terrace Suites. All rooms feature modern amenities including flat screen televisions with cable channels, telephones with voicemail services, mini-fridges, coffee makers, hair dryer and complimentary wireless Internet. Four luxurious Terrace Suites offer contemporary style with 550-square-feet of space that opens onto large balcony terraces with spectacular views over the vibrant Fifth Avenue. These beautifully-appointed suites feature king-size beds dressed in designer linens, and en-suite Italian marble bathroom with walk-in showers, Jacuzzi tubs, thick towels, bathrobes and slippers and organic bath products. Separate living rooms have comfortable queen-size pull out sofas for additional guests, work desks and chairs, and flat-screen televisions with cable channels. The Inn on Fifth is home to two award-winning restaurants – the popular, perennial Naples favorite, Truluck’s Seafood Steak and Crabhouse, and the acclaimed modern American restaurant and lounge, Ocean Prime, owned by renowned restaurateur Cameron Mitchell. Truluck’s Seafood Steak and Crabhouse specializes in fresh seafood, succulent steaks and Florida stone crab, along with 100 wines by the glass, served in a casual, cosmopolitan, and stylish ambiance. The award-winning Ocean Prime features two private dining rooms and serves a menu that specializes in pairing ocean-fresh seafood and prime steaks, with delectable sushi, appetizers, and desserts. Guests staying at the Inn on Fifth and Club Level Suites enjoy an array of signature services and amenities, including 24-hour concierge services, the award-winning Spa on Fifth with sauna and steam rooms, and a 24-hour fitness center, with state-of-the-art fitness equipment including Nautilus® Pro Strength training and Technogym® cardiovascular exercise equipment. The hotel features a rooftop swimming pool and hot tub, the acclaimed Truluck Steak, Seafood and Crabhouse and Ocean Prime restaurants, two Tesla vehicle chargers, and complimentary self-parking and valet parking service. Additional guest services include laundry and dry cleaning services, a fully equipped business center with computers and printing, copying and faxing services, complimentary transportation to the beach and downtown area, and guests have golf and tennis privileges at nearby venues. Newspapers from around the world are delivered daily, and there is complimentary wireless Internet throughout the property. Amenities exclusive to Club Level guests include a personal concierge, private seamless arrival, and check-in, complimentary food and beverage offerings throughout the day and evening including a full bar with premium liquor selections, ports and desserts in the late evening and snacks and drinks throughout the day. Guests also enjoy a turndown service, access to the exclusive rooftop deck with a hot tub, complimentary shuttle Old Naples, complimentary bottled water, and Starbucks coffee in their suites. The Inn on Fifth offers a selection of flexible and modern meeting spaces for special events and functions, along with a range of services and professional event and catering staff. The 1,876-square-foot Palm Ballroom is an elegant ballroom with burgundy carpeting and crystal chandeliers that can accommodate up to 120 guests for banquet dinners and receptions. The Palm Ballroom can be partitioned into smaller rooms for more intimate occasions, including the 1,176-square-foot Queen Palm which can host up to 80 guests, and the 700-square-foot Royal Palm for up to 30 guests.